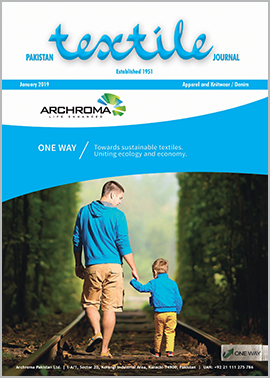 by Dr. S.M.Imtiazuddin (Popular Fabrics) and Anwer Tiki (AVM Chemicals). The story of jeans begins in the mid 19th century simultaneously in two European cities. Nimes in France, where the fabric itself was created, the so-called “Serge de Nimes” which led to the name denim. The color comes from Genoa in Italy, as in French “Blue de Genes” which led to the Expression “Blue Jeans”. The fiber and color come together to become the jeans, denim. 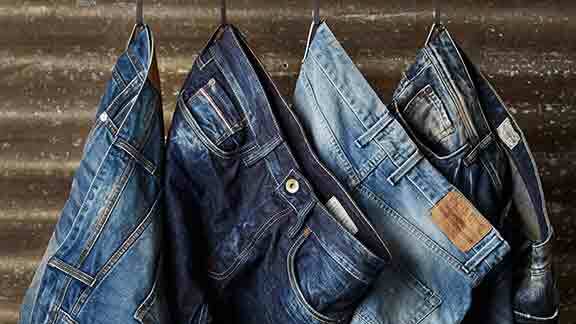 The term Denim has originated from the city of Nimes in France where serge de Nimes was manufactured. 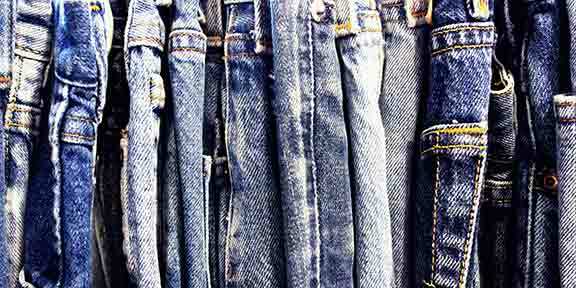 Denim is made from a vat dye, the Indigo dye, which is applied to the cotton fabric in the loosely held form in layers. 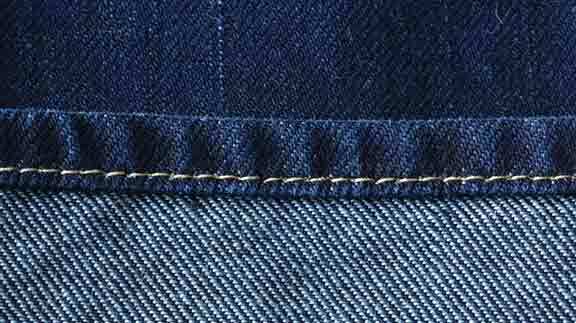 As far as manufacturing process of denim is concerned, it is similar to that of Greige fabric upto the process of weaving with the only difference that in case of Denim Fabric, it is dyed at the stage of sizing whereas, in the case of Greige Fabric, the decision regarding the dyeing stage depends upon the finished product. The initial stage of denim production is opening and blending. Opening being with the bale of cotton fibre being separated into small tufts. A blend of cotton fibres is made on each opening line. These bales are selected using the USDA High Volume Instrument (HVI) data, and PCCA’s unique computer blending software produces optimal yarn strength. Therefore, the cotton is delivered to Cards by air suction from the Opening and Blending lines, through additional cleaning and blending machines. The major function of Carding is to remove foreign matter and short fibers, from the cotton into a web and convert the web into a rope-like form known as a sliver. The drawing-in process produces a single, uniform sliver from six card slivers. The additional blending, paralleling of fibers and cleaning in this process produces a sliver for Open End and Ring Spinning process. For Ring Spinning, however, the sliver must pass through an additional process called Roving. Cotton Fibers are formed into a yarn by centrifugal action in Open-End Spinning. Individual fibers are spun into yarn, and then the yarn is wound into a large package. The open End Spinning machines have robots on each side which automatically pieces (repairs broken ends). On a different track, they have another robot that automatically doffs (removes full packages) and starts up a new package. The size and quality of each yarn end are monitored by the Barco Profile System to ensure uniformity. In Ring Spinning, the spinning frames receive Roving via a transit system from the roving machines. The yarn is formed from cotton fibres that are twisted together after being drafted by passing between three steel rolls and three rubber rolls. The yarn then is warped on a bobbin as it spins on a spindle by use of a traveler. The relationship between roll speeds, traveler speeds and spindle speeds controls the amount of twist in the yarn. Ends down levels and production information are gathered by the Uster Ring Expert System. The spinning frames automatically doffs bobbin full of yarn and send them to package winding ACG, which when needed one can produce Amsler Open End yarn, also known as Faux Ring Spun yarn. This technology enables ACG to impart various slub patterns into an Open-End yarn. Denim made from this type of yarn character and surface interest that cannot be achieved with traditional Open-End yarn. It is important to note that for yarn used for warp should be sufficiently strong to withstand stress and strains exerted during weaving operation. Hence they are having Count Strength Product (CSP) and further sized to increase its strength. The weft yarn is directly used on weaving machines and in some cases, if required, is rewound also so as to enhance its performance in weaving. (B) Warping on Sectional/Direct Warping: The warp yarn is required to be fed into a sheet form to the weaving machines. At warping the individual cones are put into the creel (the number of cones depends upon fabric construction) and yarn from individual cones is pulled together in sheet form, wound on a barrel called warping beams (for Direct warping) or on weaving beams (for Sectional Warping). Normally if warp sheet is with patterns of different colored yarns it is processed on the sectional warping machine. (C) Sizing of yarn in Set/ Beam to Beam Position: The object of sizing is to improve the strength of yarn by chemically binding the fibers with each other and also improve upon its friction resistance capacity by chemically coating the surface of yarn/fibers. Furthermore, the number of threads in the warping beam sheet is less than a number of threads required in the whole width of the fabric. Hence multiplication of sheets by drawing yarn together from many warp beams and again making one sheet is also performed on sizing machine. On sizing, normally 8 to 12% size material on warp thread is applied. This improvement in strength and frictional resistance characteristics of warp yarn is essential because, during weaving, the yarn has to undergo serve strain and stress as well as frictional issues. (D) Drawing-in: Weaving is basically interlacement of two sets i.e. warp and weft threads in desired sequence and pattern. To obtain this interlacement, warp yarn sheet is bifurcated and opened in the form of two layers/ sheet and weft thread is inserted between so opened two warp sheets. This operation is called shedding to perform shedding the warp yarn needs to be passed through heald eyes of the heald shafts, this operation is called as drawing-in. (E) Beam Gaiting or Knotting on Loom: The beams are fixed on weaving machines, threads are tied and heald shafts are coupled. This operation is called Beam Gaiting. If undrawn warp threads are directly knotted to the threads of finished beams, it is called knotting. These operations are essential because normally weavers beam can carry the only a certain length of warp sheet on it and when so woven, the whole length is converted to the fabric by weaving machine. Further warp length is required to be fed which can be done by knotting or Gaiting other beams on a weaving machine. Conventional Shuttle Weaving System by Ordinary Loom or Automatic Looms. Shuttleless Weaving System by Air jet/Water jet/Rapier/Projectile. The shuttle loom is a conventional technology with much less production on account of slow speed and excessive wear and tear of machinery. The above-mentioned shuttle loom technology has now become obsolete. Denim is woven through shuttleless weaving systems either on Air jet, Rapier or Projectile looms. These looms are distinguished by their weft insertion methods. These types of looms adopt the latest development in weaving technology where weft insertion is done with the help of compressed air. A very high weft insertion up to 2000 meters/minute is achieved. Compressed to rapier and projectile looms, these looms are less versatile, but are economical and are used in mass textile production unit like denim. A water jet is a machine for weaving cloth (loom) which uses a jet of water. The force of air to insert the weft (crosswise threads) into the warp (lengthwise threads) water carriers the yarn from one side to the other. A rapier loom is a shuttleless weaving loom in which the filling yarn is carried through the shed of warp yarns to the other side of the loom by finger-like carriers called rapiers. A stationary package of yarn is used to supply the weft yarns in the rapier machine. The yarn which we get from the Ring frame is wound into cheeses or cones and then placed on the ball warp on which 350 to 400 threads are formed into a rope. During this process, 12 to 24 ropes are dyed at a time based on the size of the rope dyeing plant. During this process, back beams are processed on the dyeing and sizing machine instead of rope. The warp is dyed, oxidized, dried and sized at the once. According to this process dyeing and sizing is done in two stages. In the first stage, back beams are dyed, oxidized, dried and wound on a batch roll. The batch roll is then sized, dried and wound on a weavers beam. Contrary to the Indigo rope dyeing system, for the continuous slasher dyeing and sizing back beams are used in this context. That means that the total number of ends required for a weavers beam are dyed, dried, sized and dried simultaneously. There are two types of dyeing processes of denim fabrics. These are indigo dyeing and sulphur dyeing. The Indigo dyeing produces conventional blue color and shade just like blue color. Sulphur dyeing is used to produce a particular color like black, grey, rust mustered and lime. Both are vat dyestuff. Both are insoluble in water and have a very poor affinity to cellulose fibers like cotton. The final stage for denim fabrics means that the fabric is wound on a cloth roll that comes from the weaving machine at a particular interval and checked on the inspection machine. Here, at the inspection machine any possible weaving fault can be detected. Then, the fabric goes through various finishing processes, such as brushing, singeing, washing, impregnation for dressing and drying. Brushing and singeing remove impurities and hairiness of the denim fabric. After completing all of the above finishing processes, the fabric is sent to the garment manufacturing unit. Denim 1st Edition, Manufacture, Finishing and Applications by Roshan Paul. The Denim Jeans Guide-Gentleman’s Gazette. www.gentlemansgazette.com. Mogahzy. Y.E (2009). Engineering Textile Integrating the Design and Manufacture of Textile Products 1st Edition. Woodhead publication. Kadolph SJ. Textiles, 11th Edition. Upper Saddle River, N.J.: Prentice Hall; 2010. Dinker Mahajan: Known All About Denim. Mahajan Publishers Private Ltd. Ahmedabad.